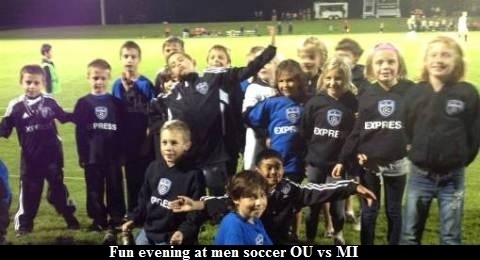 What a fun evening for Express FC boys and girls at men soccer match between Oakland University vs Michigan University. What a fun evening for Express FC boys and girls at men soccer match between Oakland University vs Michigan University on 9/24/2010 at 7:00 pm with a record crowd of over 2,000 people in attendance. Everybody had a great time and Express FC had a large turnout in attendance this event to enjoy the game. It was a fun filled evening and we look forward to another game. Thanks Express FC families for coming out to support our friends Grizzlies and Wolverines.  Express FC End of the Year Picnic Thank you for a great soccer year! Uniform Online Ordering Instructions  Reminder, please order your uniform by Monday, July 1st to receive on time for the tournament.